A German word meaning "cutlet" that is commonly used to describe a food dish using a veal, pork, chicken, or turkey cutlet as the main ingredient. Typically, the meat is breaded with flour, eggs and breadcrumbs before being fried in lard or oil. Wiener Schnitzel is a traditional German food that uses veal sliced into thin fillets that are then pounded to form the cutlet. The cutlets are then breaded and fried in oil for approximately 5 minutes per side. 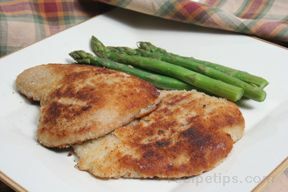 Pork scallops or scallopini can be substituted in recipes requiring Wiener Schnitzel.